This multi-colored glass beads bracelet is just gorgeous. It reminds one of a garden under the moonlit warm night sky and the tantalizing fragrance from the flowers carried by the soothing night breeze. As you look at this beautiful beaded bracelet, you will understand what I mean. See the pearlescent teal blue, dark purple and black flowers nesting against the translucent purple leaves. The hearts sparkling and twinkling happily when the lights fall on them. Also the tiny micro shining beads, the pearl beads, the myriad hues of metallic purple and muad and the little you can see of the yellow copper eye pins and head pins used; all added up to make this multi-colored glass beads bracelet so delightful to behold. Indeed, colors and designs come together to form a thing of beauty. glass beads, seed beads; various designs and complimentary colors (The biggest I used are the purple leaves. It's 10mm long). Test the lobster clasp to ensure that it is working properly. Fold the beading wire into half. Insert the folded side into the clasp's loop making a loose loop. Pull the other side of the double wire and insert into the loop. Pull snugly to make a knot. Put a crimp into the wire about 0.5mm from the knot and crimp tight. Prepare the various designs glass beads and seed beads according to the instructions on how to make beaded drops using the head pins. 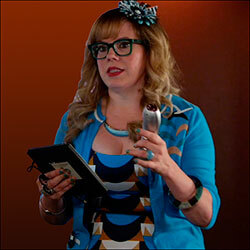 Make sure that the bracelet is about 8 inch long including the clasp. 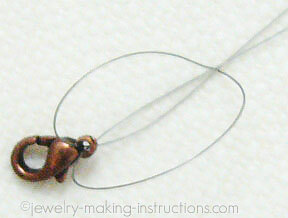 Insert the end of the wire into the loop on the other piece of the clasp and then back into the crimp again. Pull lightly and leaving a gap of about 0.5mm between the crimp and the clasp end, crimp tight. 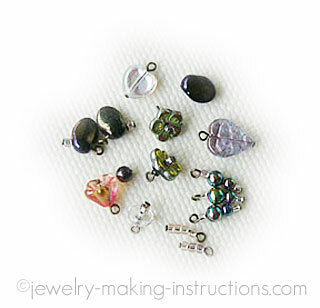 Insert the remaining wire into a few beads and cut off excess. Voila! Your own unique multi-colored glass beads bracelet. 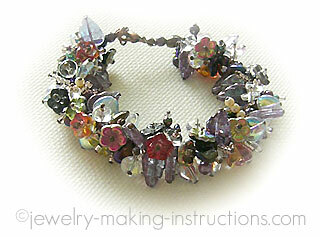 You can use semi-gemstones or other more expensive stones to make this piece of jewelry. Or if you want a lighter bracelet, then take away some of the beads and spread out the other glass beads evenly to give it a different look and feel.